Japanese Episode AG 045: "Shinkirou no Kanata ni! Togepii no Rakuen!" American Episode 317: "A Togepi Mirage!" Hanzou's attack against our heroes continues! Just as Hanzou's pokemon launch an attack at Satoshi and his friends, Kasumi's Togepi begins to emit a bright light and teleports our heroes to another dimension! 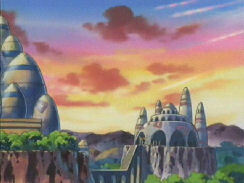 This new dimension is the Togepi's Paradise, but something is wrong; the paradise is in ruins! Hanzou's evil intentions have turned the once green paradise into a desolate wasteland, causing all the Togepi in the dimension to lose their energy! As the gang wonders what to do, Hanzou finds a way to open a portal into the Togepi's world! 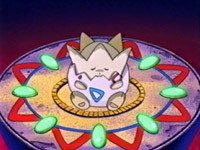 Togepi floats out to stop it, but the pokemon is instead knocked out by Hanzou's Tekkanin and Nukenin. As everyone watches, Hanzou picks up the unconscious Togepi and makes his way to the castle to claim the throne. After Hanzou is long gone, the portal reopens, allowing Satoshi and his friends to return to their world. Meanwhile, Hanzou tells the Rocket-Dan that he no longer needs them, so he kicks them out of the castle. To get back at the new king, Musashi and Kojirou, disguised as fortune tellers, tell Seera-Hime the whereabouts of her parents. Everyone gathers at the castle, where Haruka's Achamo and Kasumi's Gyarados take care of Hanzou's bug-type pokemon. After Hanzou is taken away by the palace guards, Kasumi and her Togepi, who had evolved into Togechick during the battle against Hanzou, are reunited. Kasumi's Togechick decides to stay behind to make sure the Togepi's Paradise doesn't fall into the same state as it did when Hanzou was there, so Kasumi says goodbye to her pokemon. Afterwards, Kasumi announces that she has to go back to the Hanada City Gym to resume her duties as Gym Leader there, so the gang bids their friend farewell. Now, Satoshi is off to continue his journey to Hajitsuge Town! So my most hated two-parter concludes with this episode, and if it weren't for Togechick evolving and leaving Kasumi at the end of the episode, I would merely be able to write this whole two-parter off as filler. I mean, sure, there's plenty of things that happen in this episode, but none of it really feels like it contributes to the series in any way. This whole adventure to save the throne of this country that worships Togepi for no reason seems like a diversion to the main quest, and I wish Kasumi's story had been one of those Weekly Pokemon Broadcasting Station side stories instead. In addition, this episode, along with the one that came before it, marks the return of Kasumi's annoying habit of pulling Takeshi's ear whenever he gets flirtatious with another woman. Thanks to these two episodes, Masato will now pull Takeshi's ear in just about every episode that follows when, up until now, he just kind of sat on the sidelines and watched as Takeshi made a fool of himself. Thanks a lot, Kasumi. The dubbed version is its usual quality. No real complaints on that end. Togechick keeps its Japanese voice. Also, Soko ni Sora ga Aru Kara replaces Polka O Dolka as the ending theme as of this episode in Japan. I guess they went back to the old ending theme to avoid driving kids crazy with Polka O Dolka after the first mini-movie. A second of the smoke clearing up is cut from after the title screen. Three seconds are cut from the pan shot after Kids' WB! 's main commercial break. Ash: "A Gyarados!? Whoa! When did Misty learn to use a Gyarados!?" Um...Ash? How do you "learn" how to use a pokemon? It's not like Misty had tried to raise a Gyarados before and couldn't, but now all of a sudden she can. Originally, Satoshi asks when Kasumi got her Gyarados. Satoshi never saw Kasumi catch the pokemon in the Weekly Pokemon Broadcasting Station episode in which she caught the pokemon, so his question in the Japanese version makes more sense. A four-second shot of the castle is removed right before Kids' WB! 's final commercial break. Two seconds are cut from the pan shot right after Kids' WB! 's final commercial break. And finally, one second is cut from the TO BE CONTINUED... screen.